2 Panel Canvas Prints Design your own 2 Piece Wall Art Today! Our specialists call this as ‘two bodies and one soul’. 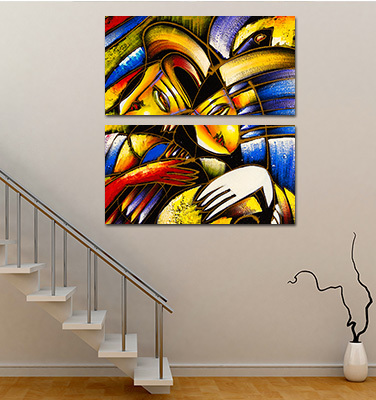 Diptych canvas art in particular is recognized as best option when your portrait is comparatively taller than its width. The custom diptych canvas prints trend that’s taking off in the world of home décor, and for good reason! Add something unique on the wall. Easy to use online design tool. Range of mesmerizing contrasts to gain that special attention. Explore your creative side by choosing multi panel canvas prints to give an artistic touch to your splendid moment. Your personalized 2 panel canvas prints are crafted with love, and packed with utmost security, to ensure that it reaches your doorstep flawlessly in a ready to hang condition. Use them vertically, horizontal, or staggered, the two-piece wall art splatters unmatched essence of art in the best quality. 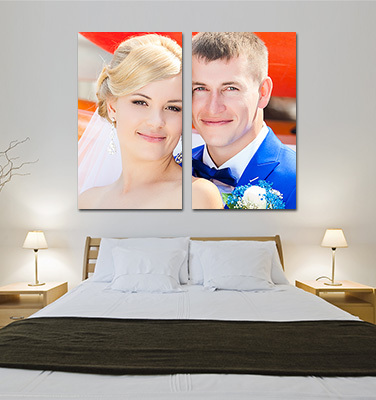 You can either extend single image on two split canvas prints or can use two different images to build one memorable art for your home/office decor. Part one single picture into a progression of various canvas prints is a pattern that is taking off in the realm of home style, and in light of current circumstances! 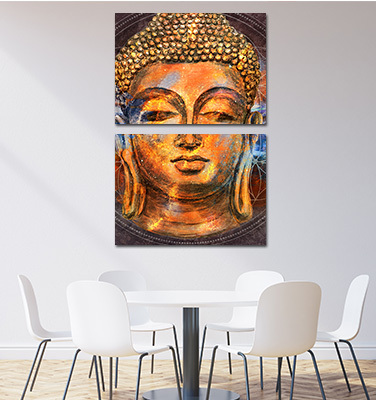 Multi panel Canvas Prints made at CanvasChamp are stunningly clear and can add essence of love in any room. 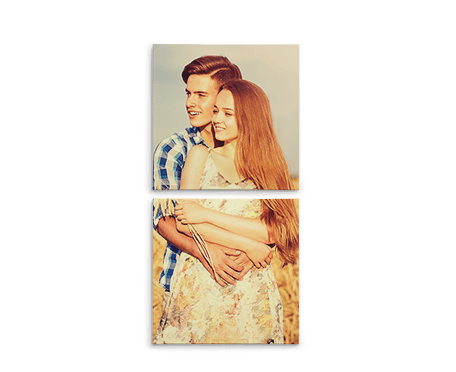 Building a multi-panel canvas print from a solitary picture has never been simpler: simply share your photograph and let us deal with the rest! 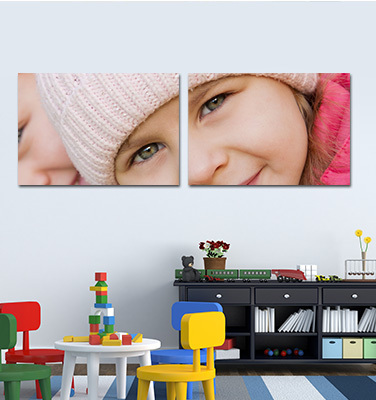 With multi-panel canvas prints, you can effortlessly cover large white space on your wall with a solitary picture. Defining Tych in simplest language, it is Greek word, which means fold. Having said this, diptych means two-fold, triptych means three panel canvas prints, and so on. Isn’t that easy to remember?. Parting picture into two canvas prints is a fabulous method to get the appearance you need for your home/office walls, without going canvas insane. Diptych Canvas Prints are likewise ideal for comparatively smaller spaces where you can’t print your photograph on three or four boards or doing so can make it look messy. 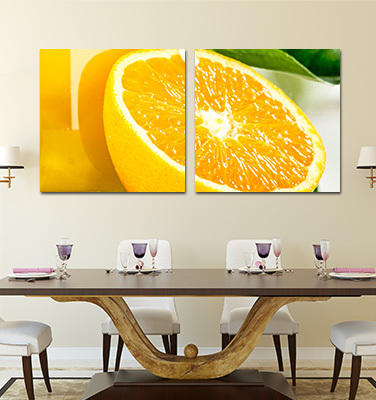 Add the touch of unmatched creativity in your room with surprisingly attractive split canvas prints. 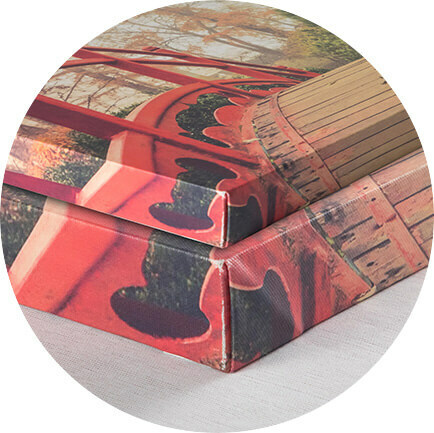 Diptych Canvas Prints built at CanvasChamp are built to deliver happiness at your doorstep. 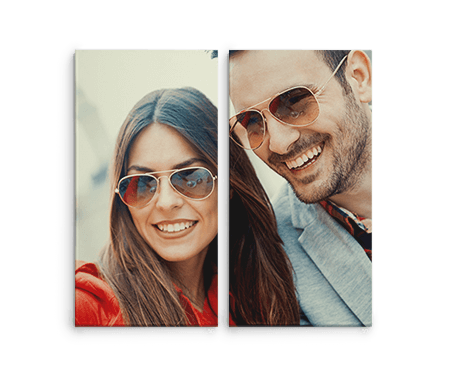 When you upload your picture that you need to transform into a Multi-Panel Canvas Print, we will demonstrate to you a sneak into how your framed canvas print will look. At that point you have the choice to pick the sort of edge you'd like your craft to have – and, as we offer the biggest assortment of edge choices in the nation, you'll have no deficiency of alternatives! You can look over a reflected edge or a hued edge. In the event that you choose a hued edge, you can choose a shading that matches your photograph or room stylistic layout, or settle on something more nonpartisan, similar to dark, white, or dim. Whichever you settle on, the structure of your picture will stay on the substance of the canvas prints, so nothing will be lost on the edges. There are two particular looks with regards to the diptych Multi-Panel Canvas Prints: Side-by-Side Panels and Stacked Panels. The former is more broad in comparison to length when assembled and showed on the wall (so the individual canvas prints are really vertical), while Stacked Panels are taller than they are wide (with every individual print being imprinted in an even configuration). Picking the introduction that matches your photograph to encourage keep the need to edit out excessively of your picture is the best you can do. 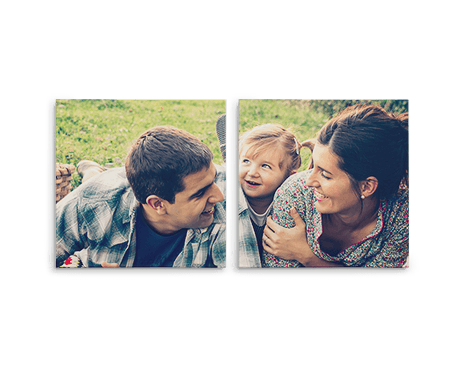 Let’s take an example, if your photograph has a scene introduction where it is more extensive than it is tall, Side-by-Side Panels would be the best item for your photograph. On the other hand, if you have a representation photograph that is taller than it is wide, the Stacked Panels would be your best alternative. The multi-Panel canvas prints made at Canvas Champ are hand-stretched to flawlessness by our expert artisans. 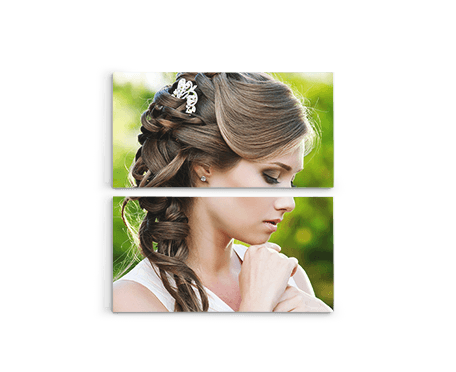 We print your photographs utilizing certified HP printers and your craft is secured with a best in class overlay method and UV resistant cover. Surf through our Canvas Prints page to find how our team has won hearts of our global customers. Your specialty will endure forever and you will love it! 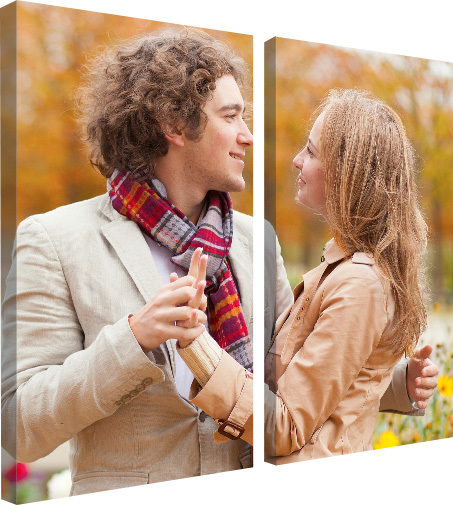 Beautify your walls with an unconfined range of size and split options, the diptych split canvas prints can add dimension to your home/office walls. Spruce up your home with a two panel wall art. 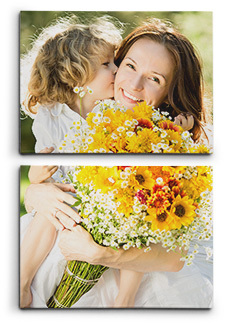 2 piece split Canvas Prints are available in most popular 1.5" thick gallery wrap canvas. Our diptychs are a perfect option for filling large spaces of your wall in the more creative way. Upload any image, choose your size and edge options, and you're ready to go! 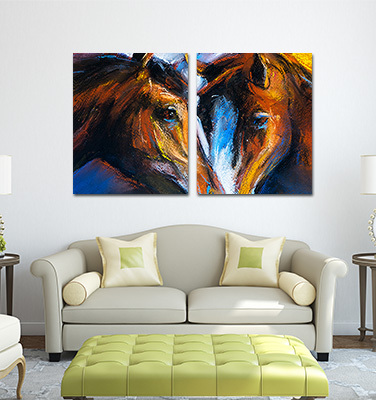 2 piece canvas wall art, Two Is Better Than One.